Birthdays should always be spent doing your favourite things, and for me, drinking a Mojito at one of my favourite London hotel bars is definitely a must do, and so I found myself at The Blue Bar at The Berkeley, sipping on an absolutely delicious and very refreshing Mojito, while Amit tried the Finest Berkeley Brew, a Craft Beer which he thoroughly enjoyed. After enjoying our respective drinks we headed to a gorgeous dining room, at Michelin starred Marcus at The Berkeley, for my birthday lunch. It was my first time dining here and I was so excited as it had been on my list for a while, and ever since the new Michelin Guide came out at the start of October, I had been determined to try more restaurants featured in it. Being the birthday girl (and using it as a firm excuse), I decided to order a glass of Blanc de Blanc Champagne whilst we decided on our dishes. We had opted for the 3 Course Lunch menu, and I had asked for a Vegetarian one (even though I am not vegetarian) whilst Amit chose from the regular one. If you are vegetarian there is lots of lovely choices for you on the separate vegetarian menu. First we enjoyed a Foie Gras Amuse Bouche followed by a Pre-starter of Pickled shallots, mushroom powder and artichokes, which was delicious. We also had some delicious freshly baked Potato and Fennel seed bread to share with some salted butter, which went down a treat. For my starter I chose the Delica pumpkin with truffle and smoked almond, which was divine. Anything which has truffle is a winner for me! Amit picked the Cumbrian pork belly with carrot, mustard and rose, which he devoured with glee and said it was full of flavour and really tasty. My mains was a Herb, Pappardelle with Kale, confit lemon and cobnut. The waiter explained to me that the chef was really proud of this dish as he had an Italian background, and it was truly delicious. I loved the various flavours and textures and it was like a comfort dish. 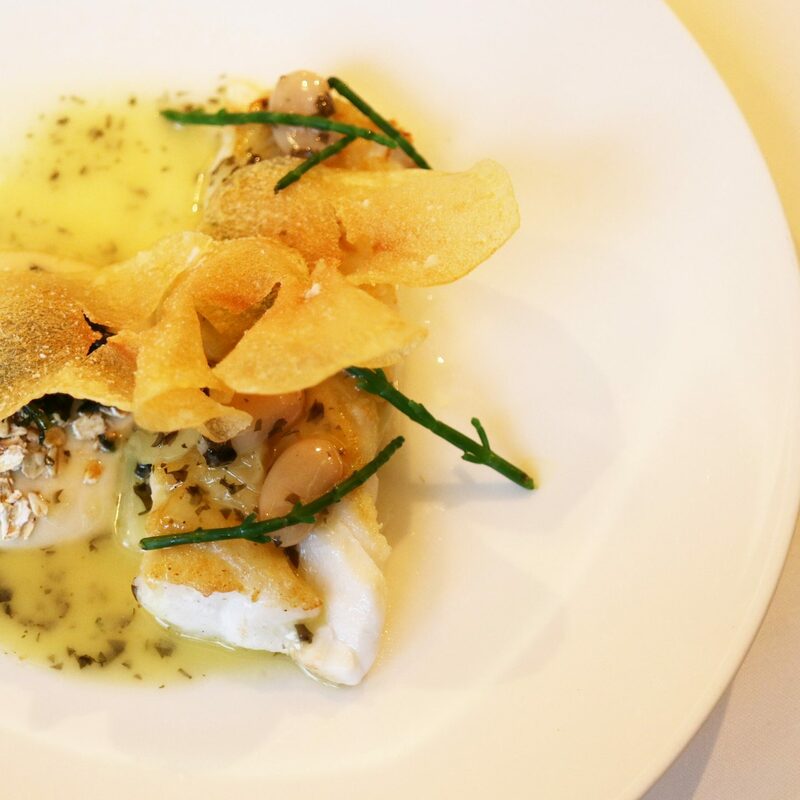 From the main set lunch menu, Amit chose the Roasted cod with laverbread, oat and Monk’s beard, which he really enjoyed. I did try a little bit of the cod and it was really appetizing and cooked really well. I loved the presentation of it too. Amit also picked the Delica pumpkin with chicken skin and truffle as a side, which was a similar non-vegetarian version of my starter, and I did try some and it was really delectable. Dessert was an exquisite affair with Amit enjoying the Pineapple cake with rum, which took him back to Caribbean holidays (much to my delight) and had him dreaming of steel bands, sandy beaches and rum cocktails. I chose the Hazelnut cake with pear and fig, which was a lovely autumnal dessert and really light. The lovely staff at Marcus at The Berkeley also brought over a birthday dessert with a candle which was so sweet of them and it made the experience even more amazing. I had a fantastic meal and really recommend the lunch set menu priced at £55 for 3 courses. It is a fabulous way to try the dishes and the service is fantastic. I would be back in a heartbeat. Other meals I have enjoyed at The Berkeley include The Prêt-à-Portea Afternoon Tea which you can read about here. This post is bringing back mouthwatering (randomly) birthday memories of my own! It really is such a beautiful restaurant!